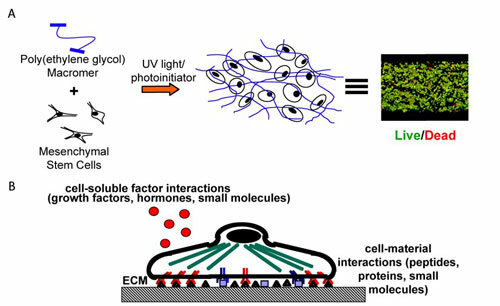 We can interrogate and take advantage of the critical interactions between cells and extracellular matrix (ECM) to create bioactive materials capable of controlling cell function and tissue evolution (described in Figure 1). To determine the requirements of the microenvironment, we utilize hydrogels easily modified with respect to mechanical integrity, adhesive peptides, ECM molecules, degradability, and incorporation of drugs, to direct cellular differentiation through a variety of mechanisms. Figure 1. Solutions of poly(ethylene glycol) macromers with vinyl functionalities can be combined with mesenchymal stem cells and photopolymerized (A), yielding viable encapsulated cells. Hydrogel characteristics can be altered to provide avenues for cell-material interactions and incorporate soluble factor deliver (B) to control cell differentiation and function. In particular, we are interested in utilizing hydrogel microenvironments to direct encapsulated mesenchymal stem cell (adult stem cell) function for applications in musculoskeletal tissue engineering, where the encapsulation process is shown in Figure 1. A thorough understanding of how material properties effect cell differentiation and tissue evolution is essential to tailor 'instructive materials' to direct cell function. 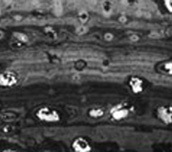 The evolution of bone-specific collagen matrix by osteogenic cells prior to mineralization is monitored in hydrogels using standard histological methods. 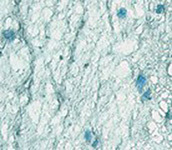 Collagen is stained in blue. In this case, chemical moieties are tethered into the hydrogel network to direct adipogenic differentiation of mesenchymal stem cells, as indicated by positive peroxisome proliferating activated receptor gamma. Mesenchymal stem cells are easily encapsulated into poly(ethylene glycol) hydrogels to exploit hydrogel mechanics and chemistry to control cell behavior and deliver cells in vivo. 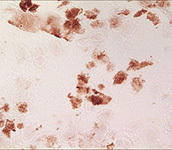 Post-polymerization, these cells are found to be viable, as indicated by LIVE/DEAD staining where live cells stain green and dead cells stain red. To facilitate functional bone regeneration, as depicted here, hydrogels can be used to deliver and direct the differentiation and matrix evolution of progenitor cells such as mesenchymal stem cells. 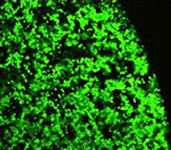 Hydrogels can be designed with the appropriate signals to direct the healing of many tissues. 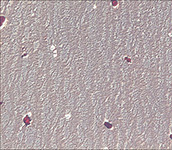 In this case, chemical moieties are tethered into the hydrogel network to direct adipocyte differentiation of mesenchymal stem cells, as indicated by intracellular Oil Red O staining.